On February 2nd, 2018 it was decided that Starbucks Corporation was not at fault for the injury of Marcus Roh. The family of four ordered their drinks without issue. While there, as testified by the older brother Alexander, he and Marcus “were playing on the poles because they were bored, and he thinks he was swinging on the ropes.” As they were leaving, the parents, Beebe and Lucas, heard a loud noise and then their son, Marcus - who was three years old at the time - began crying. When Lucas turned around to address his son, he noticed that one of the stanchions had fallen. He picked up his son and the family went to the Lurie Children's Hospital. "Shortly thereafter, Marcus was taken by ambulance to the University of Chicago Medicine Comer Children's Hospital, where the Rohs thought doctors may be able to save Marcus' damaged finger." Unfortunately the finger could not be saved and was amputated. Another finger that was injured "was treated with the insertion of a pin that was later removed." In response to Marcus losing his finger, Beebe Roh sued Starbucks Corporation on behalf of Marcus, claiming its negligence caused Marcus' injury. The case was heard in federal court, where the district court granted summary judgment in favor of Starbucks. It was decided "that under Illinois Law, Marcus' parents, not Starbucks bore the responsibility to protect Marcus from the obvious danger posed by playing on the unsecured stanchions." Beebe Roh appealed, maintaining "that Starbucks had a duty to prevent the injury because neither they nor Marcus were aware of the danger posed by the stanchions." The main argument was "that summary judgment was improper because they could not have anticipated that the stanchions might fall, and thus there is at least a question of fact as to whether the danger posed by the stanchions was 'hidden.' "
Despite neither Beebe nor Lucas witnessing the stanchion falling, and never asking their sons how it fell, "the record establishes that the boys were playing on the rope and stanchions." As Illinois law states that "generally landowners or occupiers in Illinois owe no greater duty to small children than the duty owed to adults" it was decided that Starbucks was not negligent. Despite this, the Rohs' were adamant that "they were not and could not have been aware of the dangerous nature of the stanchions, and thus could not have exercised due care to prevent Marcus' injury." The appeal court agreed with the district court in that "it is a matter of common sense that serious injury could result from climbing on the stanchions and swinging from the ropes connecting them together." Also, "the Rohs need not have seen the particular accident that befell Marcus and its disastrous results. It was enough that the Rohs saw the stanchions, which were plainly heavy. That any parent could foresee that a child hanging from the rope connecting the stanchions or otherwise playing on or around them could be injured is sufficient to support the conclusion that Starbucks did not breach any duty to Marcus." Beebe Roh attempted to create a parallel between their situation and "the situation in Perri v. Furama Restaurant, where an Illinois appellate court concluded that there was a genuine issue of material fact as to whether a restaurant owner was negligent in placing a pot of hot tea on a lazy susan without notifiying parents at the table of the tea." The court disagreed, stating that "the parents were completely unaware that the tea had been placed on the table, and therefore could not have foreseen that their son might tip it over by spinning the lazy susan on the table." As a last attempt to sway the court to their side, the Rohs insisted that Paul Punke - the creator of the stanchions - "did not intend the stanchions to be unsecured." 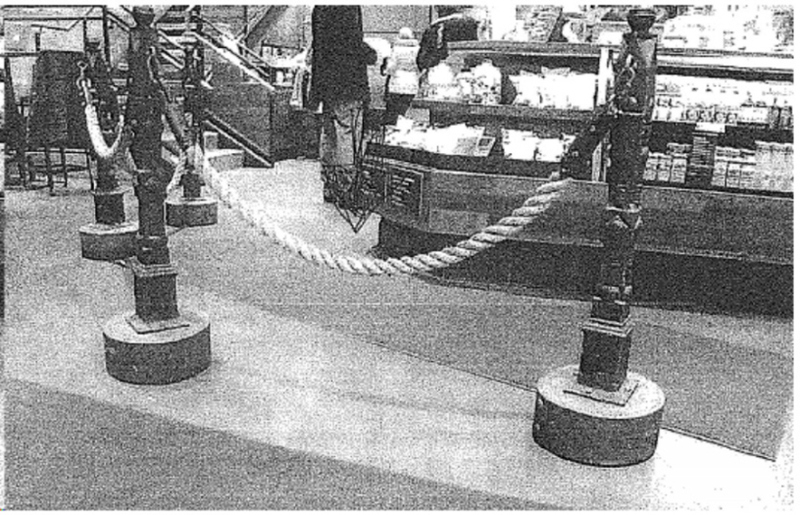 This is not entirely accurate however, as "Punke did not testify, as the Rohs claim, that he recommended the stanchions be affixed to the floor. Instead he explained that they had bolted similar stanchions to the floor in the past but that the heavy concrete base was created to stablize these particular stanchions so they would not have to be bolted to the floor." As such, the appeal court affirmed "the entry of summary judgement in favor of Starbucks Corporation."